If young people and children living in the UK were asked if they knew the meaning of Remember, remember, the 5th of November! – would they know to what it referred? I guess a lot would depend on the ‘cut off’ point regarding age group, and interestingly enough, the North-South divide also. However, there would be no comparative lack of knowledge in respect of the Halloween season. 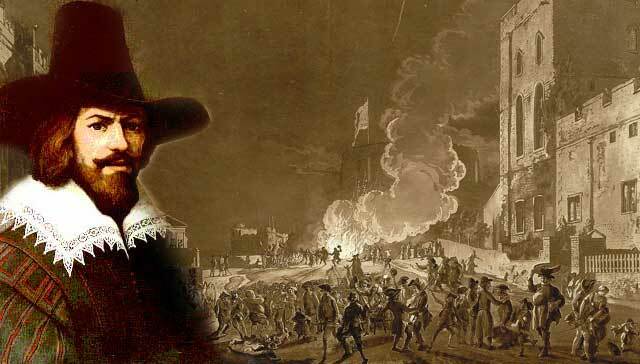 Guy Fawkes, as the link outlines, was caught trying to blow up the Houses of Parliament a few centuries ago. Therefore it is a major historical event for the United Kingdom and also, by default of the storyline, London, England. 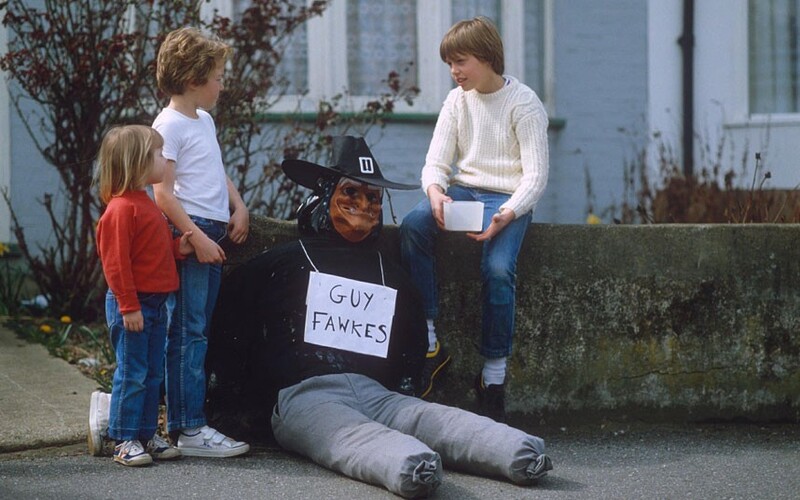 It used to be a tradition, coming up to 5th November each year, that children would take hours and days of their spare time making a personalised ‘Guy Fawkes’ out of any materials they could get. Items such as discarded old hats, pillowcases (to be covered as if representing Guy’s stomach, perhaps trousers over tubing, shoes, etc), enough to pad out a figure which had jacket, trousers, socks, scarf so that the finalised ‘Guy’, especially if put in a wheelbarrow and transported about town, would earn them ‘donations’ from adults in admiration. Sometimes the children used their initiative and waited at railway stations for commuter trains to return with workers on their way home. They often received more donations and then went on to local residential areas house to house, with the polite enquiry of ‘Penny for the Guy?’ This created great joy in most households as they rushed to see another homemade Guy. Often the Guy received generous donations. Some children were smart and would walk with the guy standing up between them – arm in arm like a scene from the movie The Great Escape. Then they would say ‘We know it will be difficult, but can you guess which one is the Guy’. This would give the homeowner the perfect opportunity to choose the wrong one, and say about the Guy, ‘Oh I thought he was your friend’. Others would show different kinds of ingenuity and the Guy may have an RAF style moustache, a false pipe in his mouth, Military hat and wearing a Bomber jacket. Probably all to be returned to the real owner in good condition. On bonfire night the Guy was put on top of a big bonfire, either in one’s garden or on the top of a communal bonfire in the local area. There was the same option regarding firework displays as long as the event was supervised by an adult, the fireworks to be kept in a safe metal tin, and that all pets were to be kept from harm’s way indoors and reassured so they were not nervous. School children would save up for weeks and their Parents would take them to the stores who sold every firework imaginable. School time provided great opportunity as there would be excitement about bragging to friends in respect of who had bought the biggest rockets, etc. Sparklers still remain my favourite to this day and it is prudent I do not outline what types of fireworks were available years ago. We were always told to respect their potential harm though and to follow instructions as to their use. The first thing I would like to ask is are American children making a Guy Fawkes this 5th November and will they be going door to door raising money by saying ‘Remember, remember, the 5th of November?’ Of course not. Not only do/did some unpleasant residents put razor blades in bowls of sweets which was customary to give out, but refusal to give anything (money probably preferred) could offend and a resident could get eggs flung at their house for weeks. Both children and adults dress up in ghoulish costumes and paint their faces. Parents have to accompany their children to protect them from abuse. So why is it in England we have had this custom exported to us in this commercialistic format in place of Guy Fawkes, a more prominent event for our own history? It is two-fold. (1) children get quicker and greater awards for half the effort; (2) it is better to do that than make a Guy, whom they know nothing about, but they should. It will not be long before Thanksgiving appears on the scene. We now have beef jerky, twinkies, waffles, coffee bar chains, and sometimes it feels as if we are an American State! My argument is not with the Americans, as they say, “some of my best friends are Americans”, but not at the expense of our heritage. Years ago ‘Bob a job‘ was a great British tradition whereby supervised Scouts would knock on doors and ask if one needed a job doing for an hour and the payment would be one old Shilling! Tidy up the garden by pulling out weeds, mowing the lawn, throwing out garbage, chopping wood (supervised), going to collect something from a nearby shop, in fact their help really was help. 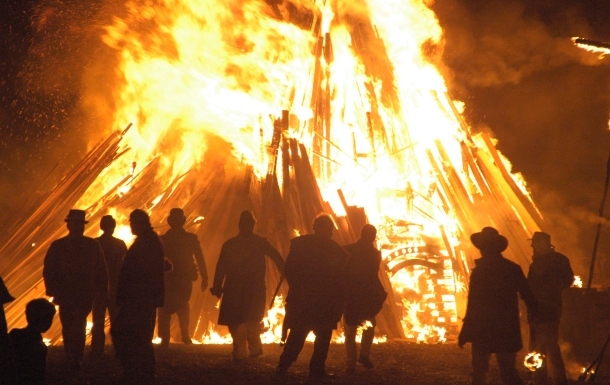 If I encountered an old fashioned Guy Fawkes this year I would give a child £20+ for upholding our tradition. It looks as if there will be no takers. Libraries in recent years have given out notices to put on doors which tell any visitor at Halloween that they wish them well but the person cannot come to the door (hopefully no eggs are thrown that way too.Many keep their house lights off inferring nobody is at home so do not answer the door). 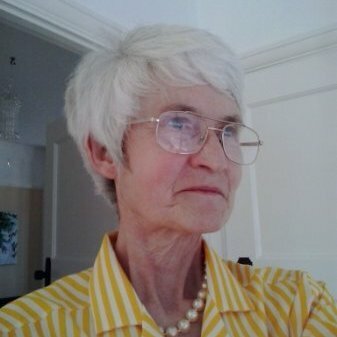 We do not celebrate St George’s Birthday or Shakespeare’s birthday and there is just a mention in the media regarding the real birthday of Her Majesty The Queen (all in days of each other during the month of April). As the Americans say, and it is borrowed herein, but just, please, for this reference in respect of our Heritage – ‘Either use it or lose it’! Next post My Papillon-Like Obsession!